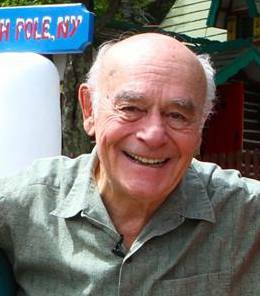 Bob Reiss, the son of founder Julian Reiss and former owner of the park himself, knows all the history of the park firsthand. He takes us on a tour of Santa’s Workshop, from choosing the site to pointing out the influence of artist Arto Monaco, who created the whimsical look and feel. Julie "Jingles" Robards is a park performer and curator of the park's Memory Lane Museum. She takes the audience on a tour of former Adirondack theme parks in her vintage Dodge Meadowbrook. Bobby Getchell is a union electrician and plays Paul Stanley in NJ's premiere KISS cover band, Dressed to Kill. As one of Santa's Workshop's superfans, his family has been going to the park every Christmas since 1949. Roy Holzer is a Wilmington local who is committed to growing the Adirondacks tourism industry, while maintaining the town's small town feel. Christa Orth, producer (left) and Ali Cotterill, director (right) have been collaborators since 2004. Their short films have screened at 100+ festivals around the world, won several awards, and been broadcast on Logo TV and Current TV. North Pole, NY, is their first feature. When they're not filming in the beautiful Adirondacks, Ali works as a film and video editor and Christa works as a consultant at a fundraising and design firm. They're based in Brooklyn, NY. Want to contact us? Email us at northpolenyfilm (at) gmail (dot) com. I've loved theme parks and roadside attractions since I was a kid. In 2012, I visited Santa's Workshop with the intention of doing a larger documentary about the history of theme parks. I became so enchanted with the park, the people, and the town of Wilmington, that I decided to make the entire feature on Santa's Workshop. I want to share the magic of Santa's Workshop and North Pole, NY with the world. The economic struggles of small towns across the U.S. are well-documented. As chain stores continue to replace mom and pop stores, Main Street U.S.A. is dying. Roadside attractions, once popular among state highway travelers, are rapidly disappearing in the U.S. or being replaced by behemoth amusement parks full of thrill rides. Wilmington is proof of the enduring power of both small town communities and the American roadside attraction. Overcoming floods, the recession, and a shady business deal, Santa's Workshop has provided generations of people with their first jobs since 1949. It is a true piece of 1950's Americana. North Pole, NY is a story of resilience, the power of nostalgia and a portrait of the dreamers in one small town that have vowed to keep the magic of Christmas alive all year round. It truly takes a village (a Christmas village!) to make an independent documentary. Huge thanks to all our Kickstarter donors.